Marker Nikko 99L Finepoint Black Box 12 Precision writing & technical pen- Draws a line 0.4mm in thickness- Polyacetal tip for smoothness and light touch accuracy- Long tapered shank is ideal for use with templates and stencils- Pen will not dry out if left uncapped up to 2 weeks. Waterbased ink. Marker Nikko 99L finepoint Blue Box of 12. Marker Nikko 99L finepoint Red Box of 12. 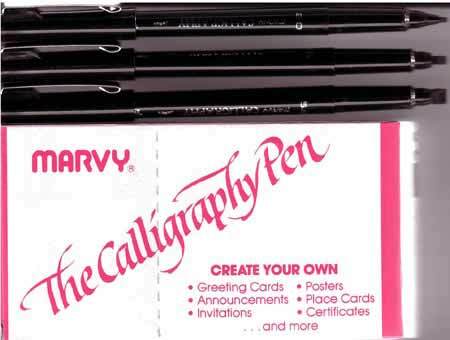 Osmer Calligraphy 2mm - Black Used to create your own calligraphy-such as greeting cards,announcements, invitations,posters place cards, and certificates. Osmer Calligraphy Pen 3 mm - Black A fibre tip disposable pen- Create your own greeting cards, posters, announcements, invitations, posters, place cards, and certificates.